Successfully adding wireless antennas to microchips could change current methods of chip architecture. PHILADELPHIA, August 7, 2012 - “Location, location, location”: That age-old key to successful real estate investing has also been the driving mantra in microchip architecture. But with space on the tiny silicon chips at a premium, as demand for faster, smaller technology increases, engineers at Drexel University could be adding “bandwidth” and “frequency” to the chip design paradigm by adding wireless antennas to the chips. The engineers recently earned a National Science Foundation grant to develop tiny wireless networks on microchips. Wireless radio frequency antennas would allow information to be transmitted from one part of the chip to another without the use of wired interconnections, the “landlines” of the microchip world. “Much like the human intestine, wired interconnections can be very long despite their ability to be condensed into a small space. However, the sheer volume of the connections necessary to make a functional chip still takes up a great deal of area,” said Dr. Baris Taskin, an associate professor in Drexel’s College of Engineering and a lead researcher on the project. Taskin’s team is working to design a hybrid network-on-chip that uses both antennas and wired interconnections to optimize communication speed and allow the chip to be used in new and sophisticated platforms. The new chip will also use reconfigurable antenna technology developed at Drexel by Dr. Kapil Dandekar, who is Taskin’s collaborator in the research. The use of radio frequencies to transport data holds an additional advantage over other wireless methods used in next-generation microchips because the radio waves can travel through solids. 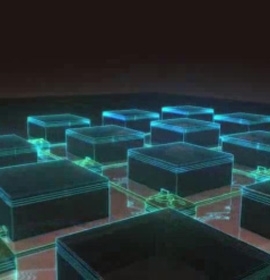 Optical data transmission, which uses light waves, is also being developed as an alternative to wired interconnections. This method requires a clear line of sight between transmitters and receivers, however, which is a significant limiting factor in design and essentially negates its viability in 3D chip development. A fully functional proof of concept could be finalized in the next five years, according to Taskin. The biggest challenges to designing the chip are the same as those experienced in developing a telecommunications network: making decisions about location of antennas, frequency of transmission and the amount of data that can be transmitted. Successfully demonstrating the concept of wireless on-chip networking could open doors for using the technique in multi-core processors and to improve 3D chip design.